Little business partner. 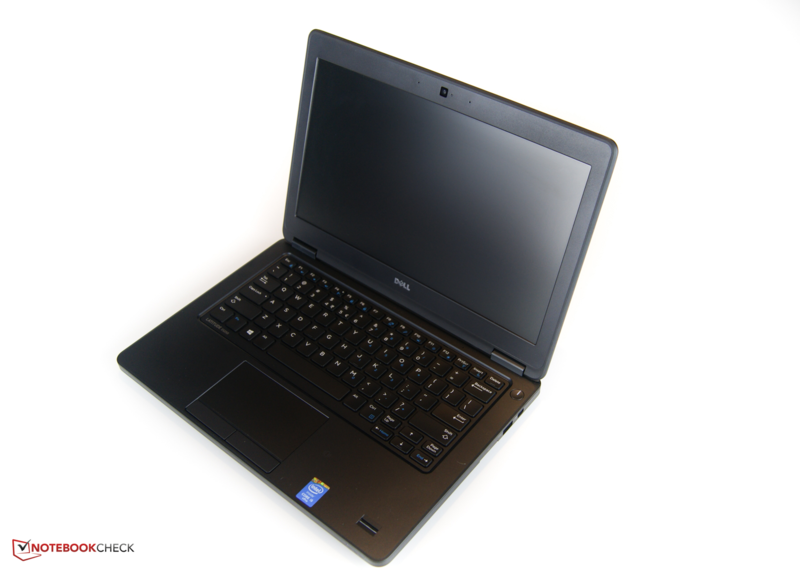 Following the positive rating of Dell's Latitude E5450 product line, we tested the 12.5-inch Latitude E5250. However, it did not completely fulfill the high expectations. 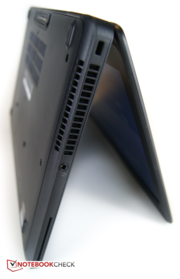 The Latitude 5000 lineup could be classified as business category laptops. 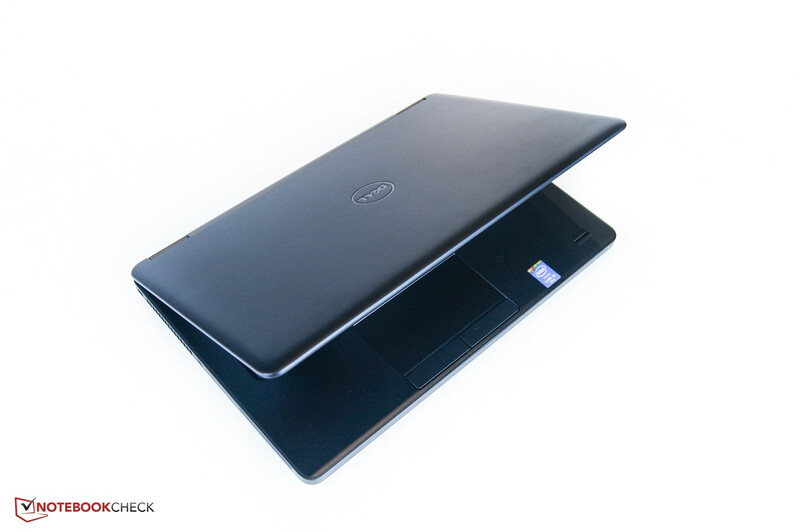 In particular, the perfect balance of quality, performance, mobility, and price convinced in our tests of the 14-inch Dell Latitude E5450 and the 15.6-inch Dell Latitude E5550. 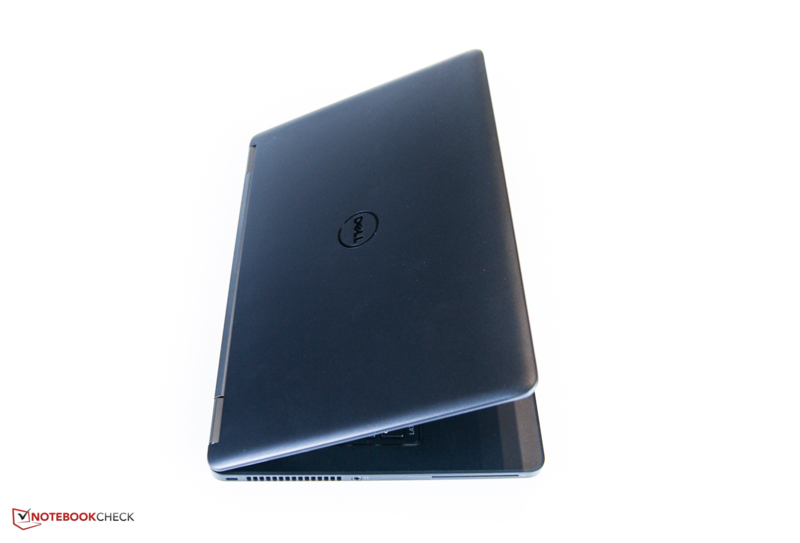 Dell now introduces a small 12.5-inch device that also wants to meet these expectations. Mobile use is possible via a Qualcomm LTE module. An Intel Core i5-4310U alongside 8 of GB working memory and swift 256 GB SSD storage ensure power as well as a sound work speed. The consistent build and choice of materials are to maintain the quality standards of the bigger models. 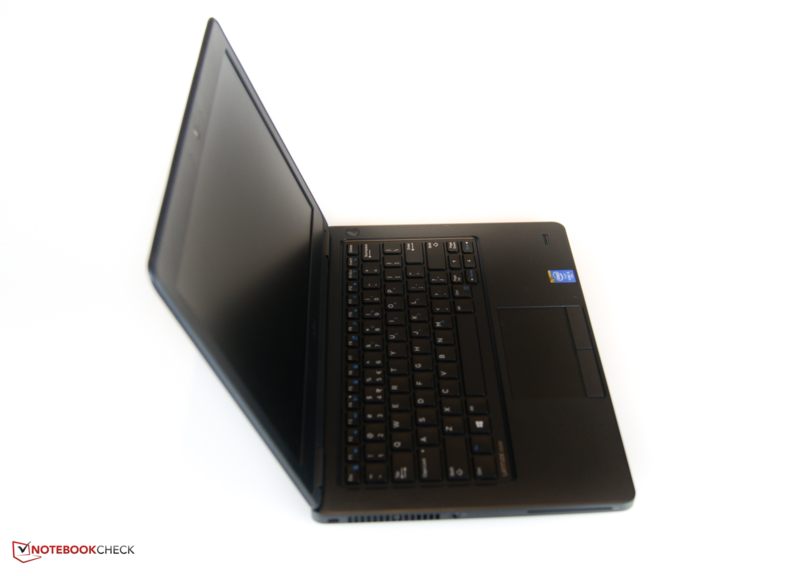 The Latitude E5250's price starts at 620 Euros (~$733). The version we tested adds up to around 1150 Euros (~$1361). 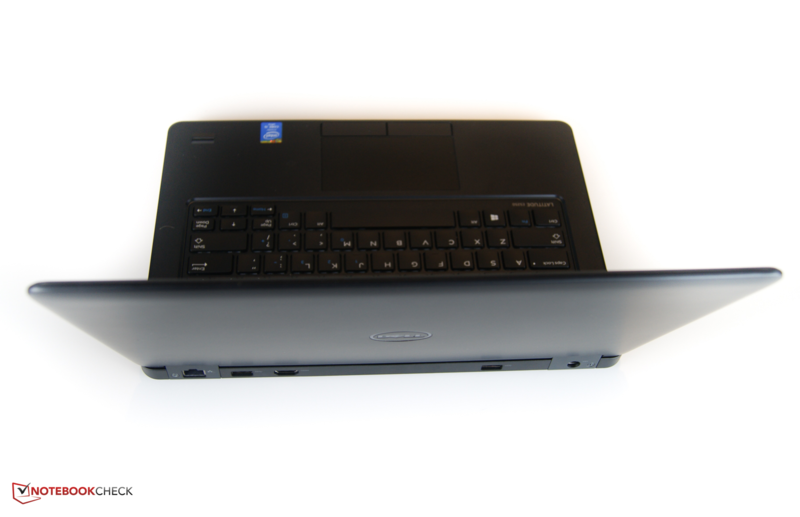 Seeing that especially small laptops are suitable for mobile business routine, the Latitude faces multiple contenders. We compared the review sample with some laptops from the competition in order to put the new E5250 product line's scores in relation. HP's EliteBook 725 G2 can be called a solid rival. Unlike Dell's laptop, HP's device exclusively features AMD components. The AMD A10 Pro-7350B processor with integrated AMD Radeon R6 is installed. However, only 4 GB of working memory and a slower 500 GB magnetic hard drive are found in the EliteBook. The price of HP's laptop is considerably lower than that of our review sample. Lenovo's ThinkPad lineup has always been considered a mainstay in the business sector and should not be omitted just for this reason. We added the Lenovo ThinkPad X240 to our round. Lenovo offers a speedy Intel i7-4600U, 8 GB of working memory, and 250 GB of storage for a steep 1850 Euros (~$2189). Asus' ASUSPRO Advanced BU201LA takes the first place in the total rating among our comparison devices. 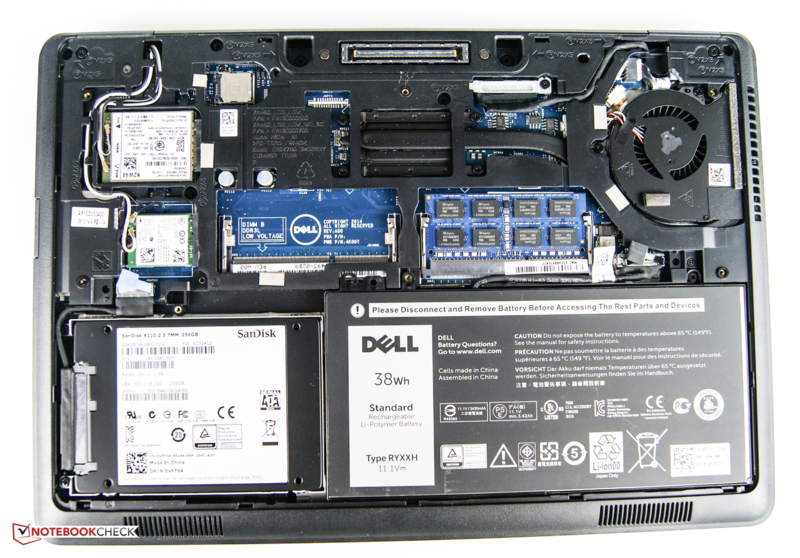 The business laptop costs just 800 Euros (~$946) but also sports weaker components than Dell's Latitude. An Intel Core i5-4210U, 4 GB of working memory, and a 500 GB storage device explain the price. Dell's Latitude lineup could be described as basic, elegant, and noble. Although the choice of materials is limited to plastic, the matte-black surface makes a rigid and high-quality impression. 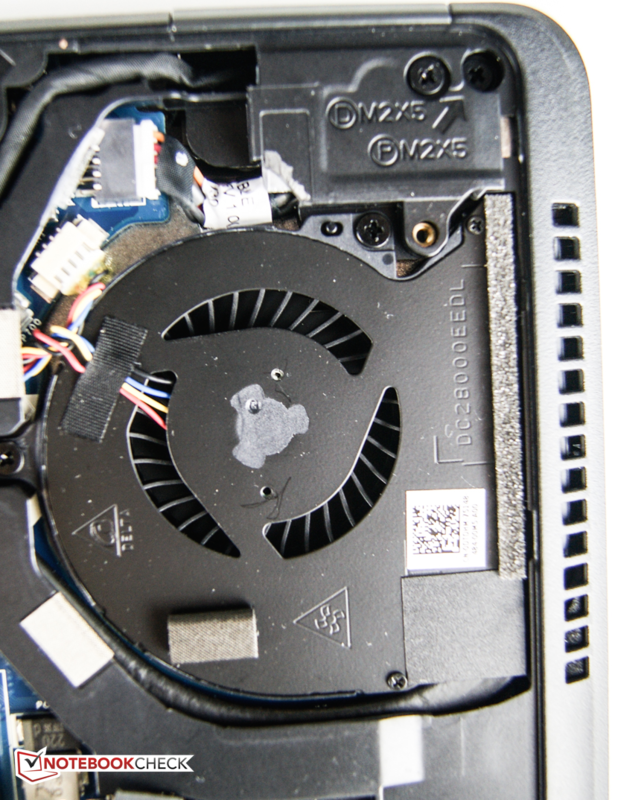 Unfortunately, the display lid is not a magnesium component like in the larger E5450. Like in other Dell product lines, it can be added to the order, though. The hinges are still covered by a metal cap. The feel of the 1.67 kg device is extremely pleasant and slip-proof. 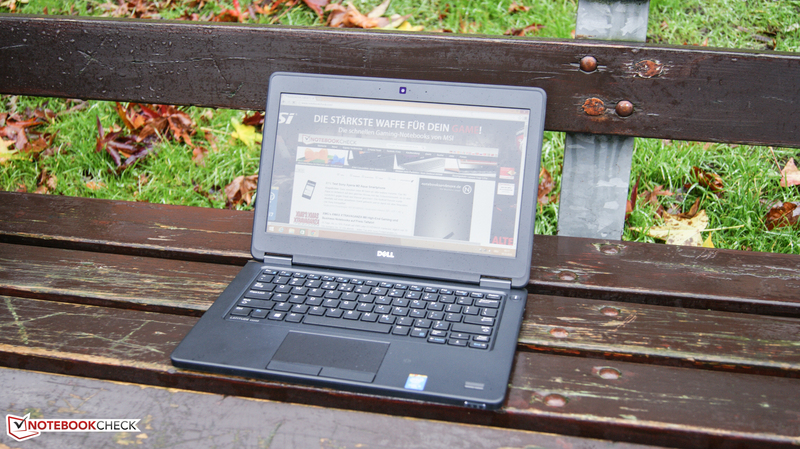 Though Dell's device is not a heavyweight, its contenders are lighter. Asus' laptop particularly stands out with 300 grams less weight. The screw-fastened base tray has to be removed for maintenance or upgrades. Replacing the battery is thus not easy, but that was similar in the larger Latitudes. An opening for all maintenance work. 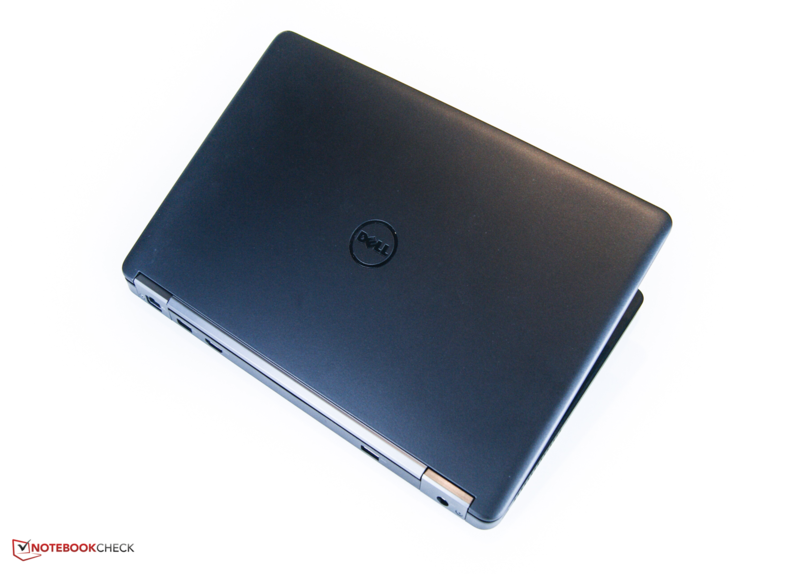 The interface-positioning strategy in Dell's Latitude remains well-conceived also in the compact 12.5-inch model. 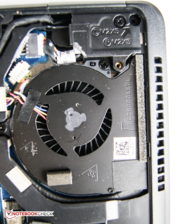 Unvarying ports, such as a VGA socket, HDMI-out and power socket, are found on the rear. 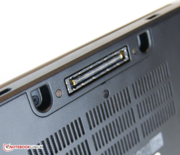 A USB port, DisplayPort, and SD-card reader have been placed in the back area of the right edge. This design ensures that impermanent connections do not impair the work space on the desk with interfering cables. A SmartCard reader serves as a security feature. It is quick to access on the front left. 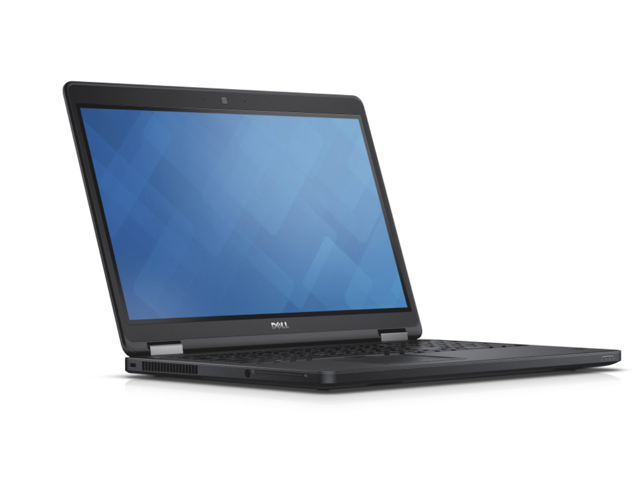 Dell's Latitude E5250 allows wireless connections via both Wi-Fi and LTE network. Its throughput rate was ascertained in a test setup specified by the writer and determines average downloads. 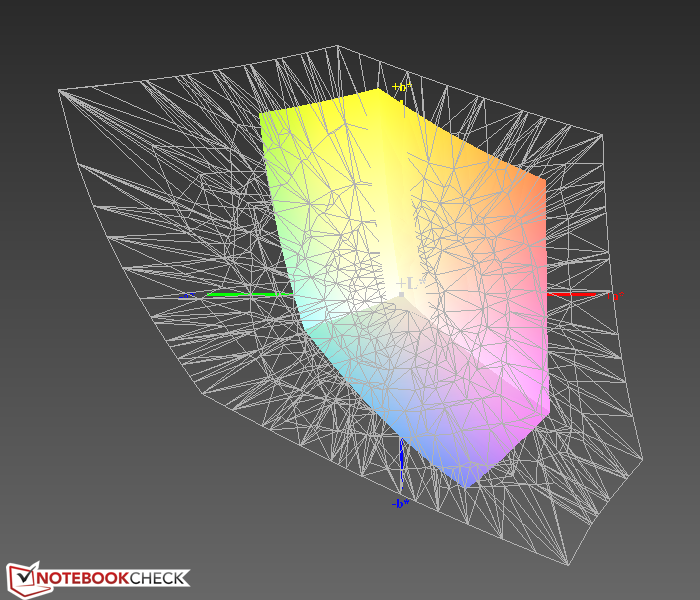 The Technicolor TC 7200 router (802.11 n; 300 Mbps gross) was located one story above the review sample. A cement wall and a wooden ceiling obstructed the direct line of 5 meters. The average is calculated after multiple test downloads. The Latitude achieved 8.9 Mbps. Dell's laptop achieved a rate of 10.5 Mbps when moving to the same story. A Qualcomm LTE 4G module is available for Internet on-the-move. The SIM-card slot is inside the laptop, and thus the device has to be first opened inconveniently. The installed 720p webcam shoots smooth images in bright surroundings. Colors and brightness blur quite quickly, though. Delayed video recordings are noticed adversely, particularly in low light. The built-in microphones are compelling, owing to their noise suppression. Security should rank foremost especially in business devices. In addition to a fingerprint reader and Kensington lock, the aforementioned SmartCard reader is a protective feature. The latter can also be used via NFC. Software security solutions are found in the well-known DDP (Dell Data Protection) security tools, which can be added to the order. Furthermore, an FIPS-certified HCA (hard drive encryption), Dell ControlVault (secure bank for storing passwords and biometric print), and Computrace (theft protection) can be found in the configurator. Details about the single security standards can be found in the security column of our FAQ. Besides a few brochures, a recovery USB flash drive is included. Other accessories are made available during the order process; the port replicator will likely be the most interesting. Depending on the interface diversity, it costs around 180 Euros (~$212) or 220 Euros (~$260). Dell also offers a DisplayPort-to-VGA adapter for 25 Euros (~$29). The entire base tray has to be removed for the occasional repairs. However, that is quite simple to do via the screws. The clips that cause the base tray to warp dangerously are somewhat disagreeable. All kinds of maintenance options are available after removal. The 2.5-inch hard drive and battery can then be taken out. One of the two working memory slots is filled. Cleaning the fan is also possible. We did not find a dedicated dust filter. It would even be possible to easily take out the Wi-Fi and 4G module without problems. Dell only includes a one-year warranty from date of purchase. Comprehensive protection for up to five years is optionally available. Further services can be selected besides this standard warranty. For example, a one-year accidental damage warranty (26 Euros, ~$30) that can be combined with theft protections (41.60 Euros, ~$49). We highly praised the input devices of the E5450 lineup. 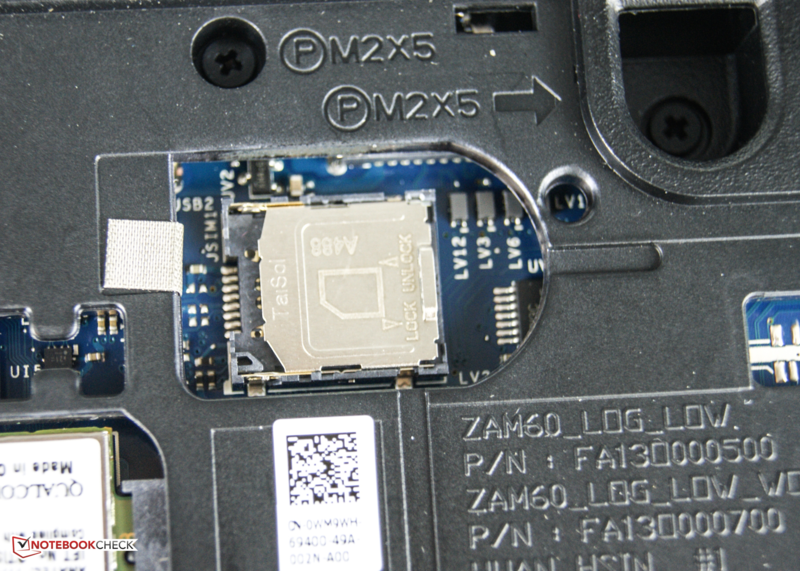 Although there is no TrackPad, the most important characteristics of the keyboard and touchpad have been maintained. The keyboard still convinces with a long, soft drop. 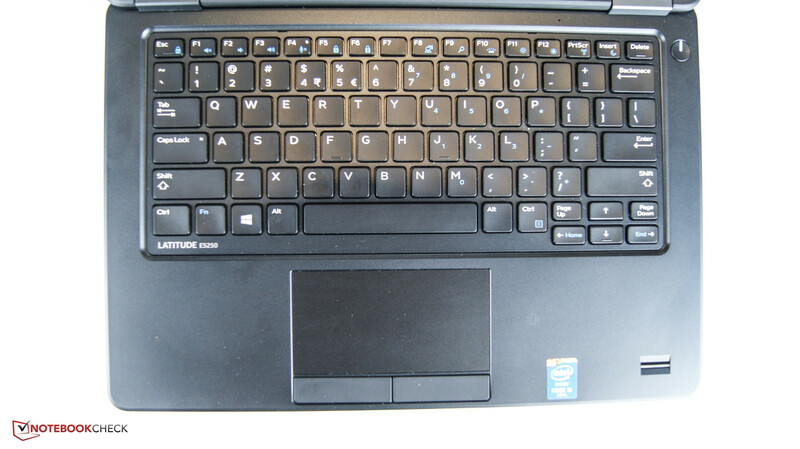 The black tile keys have enough grip and the ideal size for fast and long typing. The keyboard excels with a quiet stroke noise that will not disturb the office neighbor. All keys are firmly in place and have homogeneous pressure points. The touchpad in the 12.5-inch model also proves to be a true mouse replacement. Performing multi-touch gestures is smooth. The corners remain to be problem zones. Otherwise, the input device convinces with its accuracy and sleekness. 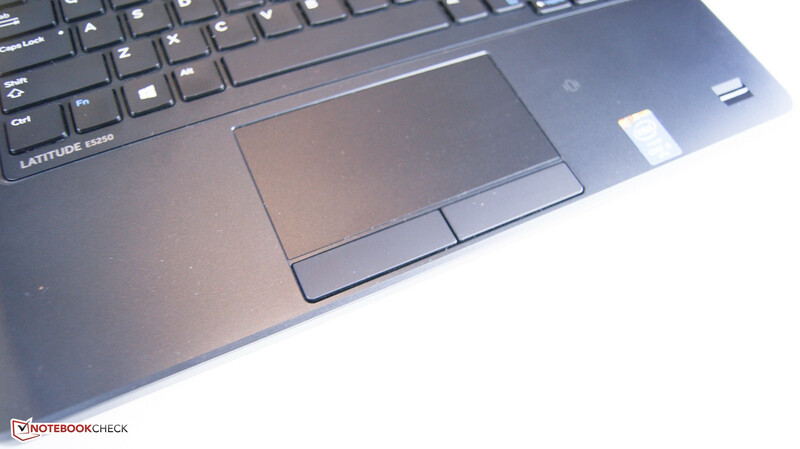 Two dedicated buttons have been incorporated below the touchpad. Like the keyboard, they feature a soft and homogeneously long drop. 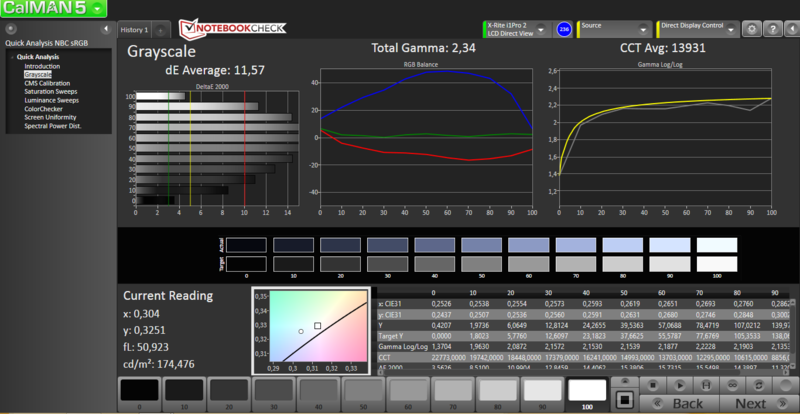 ...Latitude E5250 into a real workhorse. Clear view owing to the backlit keyboard. A TN screen with a resolution of 1366x768 pixels is to provide a good overview. 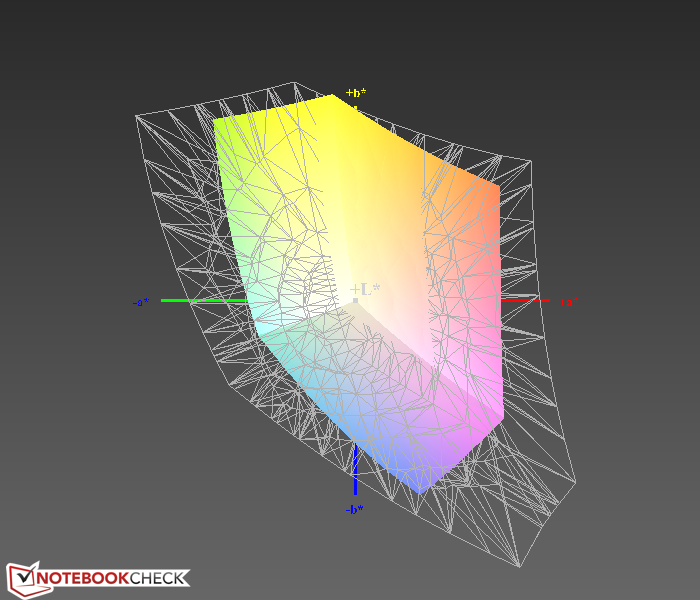 The matte, 16:9 screen has an average brightness of 160.1 cd/m². We found that distracting particularly when working in bright surroundings. Asus' BU201LA provides a visibly better brightness with almost 400 cd/m². However, the Asus also sports a high-quality IPS screen despite its low price level. According to Dell, there is an optional Full HD screen with a brightness of 360 cd/m² available. The relatively low contrast of 304:1 leads to a high black level of 0.586 cd/m². Thus, we cannot speak of a deep black. We would once again refer to Asus' laptop as a prime example for a good screen; its contrast of 921:1 is impressive. 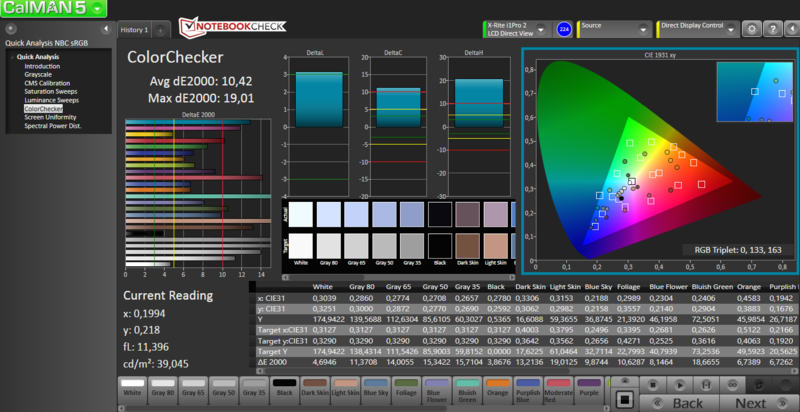 The extreme shifts in the colors and grayscale, which are expressed in very high DeltaE rates, can be reduced considerably via an adapted ICC profile. A bluish cast would be visible without calibration. Dell's laptop has not been made for professional use anyway. 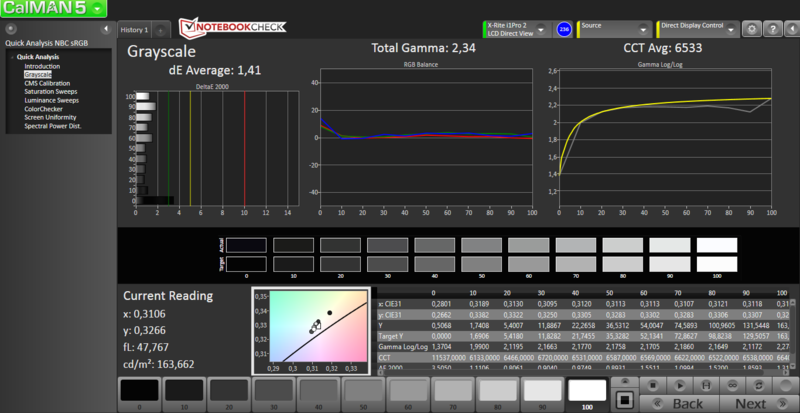 The coverage of the AdobeRGB space is 40% and that of the sRGB space is 57.5%. Although the Latitude E5250 features a matte screen, its low brightness hardly makes it outdoor suitable. It will only be possible to work with the device effectively in very shadowy places. The installed TN screen can only provide very limited viewing-angle stability. Colors and brightness are visibly distorted when the screen is tilted and when looking from the sides. A 180-degree hinge is installed to counter this and makes use in almost every thinkable position possible. It's all in the combination. 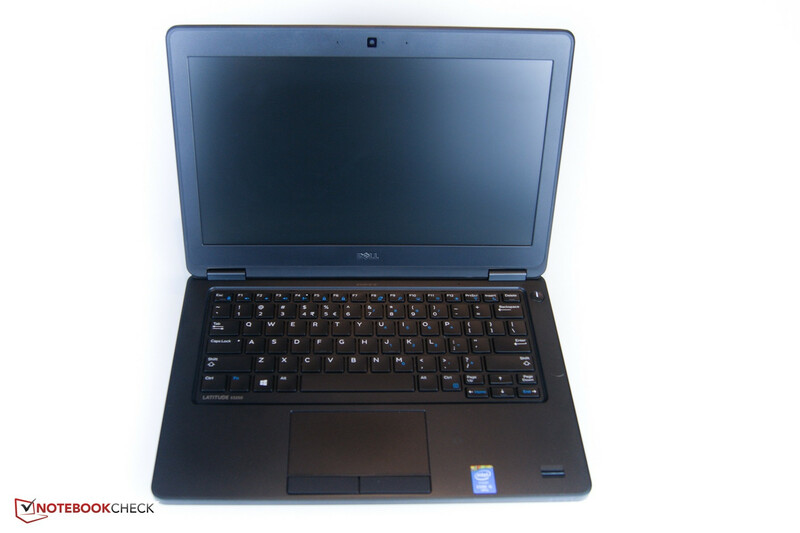 Dell's Latitude E5250 is to particularly score with fast response times. An 8 GB working memory and a swift SSD should ensure that. A ULV CPU is installed for economic and, at the same time, efficient workflow. The review sample is generally very suitable especially for office and some multimedia applications. It is perfectly suitable for the business sector owing to a few security features. However, the 12.5-inch Latitude is not a bargain with a price of 1050 Euros (~$1242). Dell uses a frugal Intel Core i5-4310U CPU. It has a base clock of 2 GHz and can clock up to 3 GHz via Turbo mode. Its general field of application is office and multimedia applications. Intel specifies a TDP of 15 W.
Cinebench R15 makes clear that the Intel Core i5-4310U can even keep up with the Intel Core i7-4600U installed in Lenovo's device. 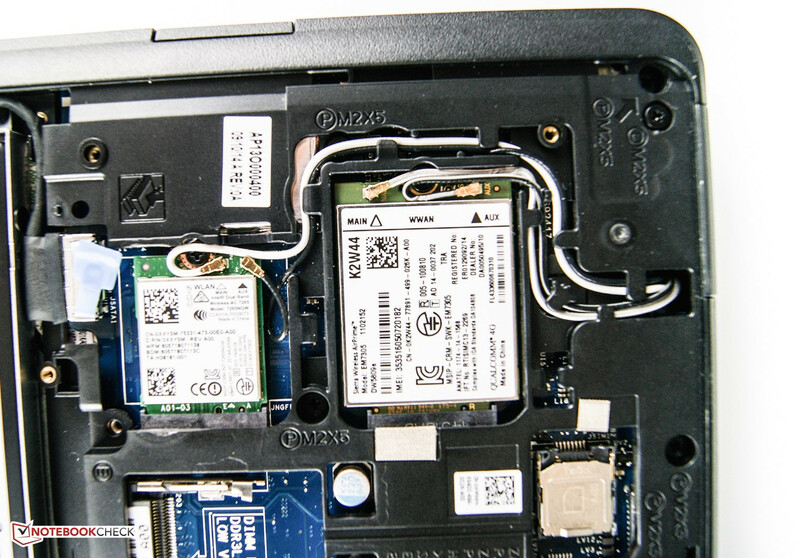 The ThinkPad only outruns all rivals in the single-core test. We did not determine throttling (base clock is undercut) in the Cinebench test. Battery mode is also possible without performance losses. The same scores are achieved in Cinebench R15. 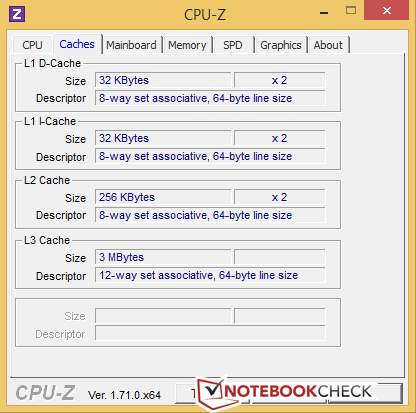 Further details about the installed CPU solution and more benchmarks can be found here. The subjective work speed was always agreeably fast. A swift SSD storage takes care of that. The system also performed multitasking smoothly owing to the 8 GB of working memory. The PCMark scores also relate this impression. Dell scores better than its contenders in all categories of PCMark 8. 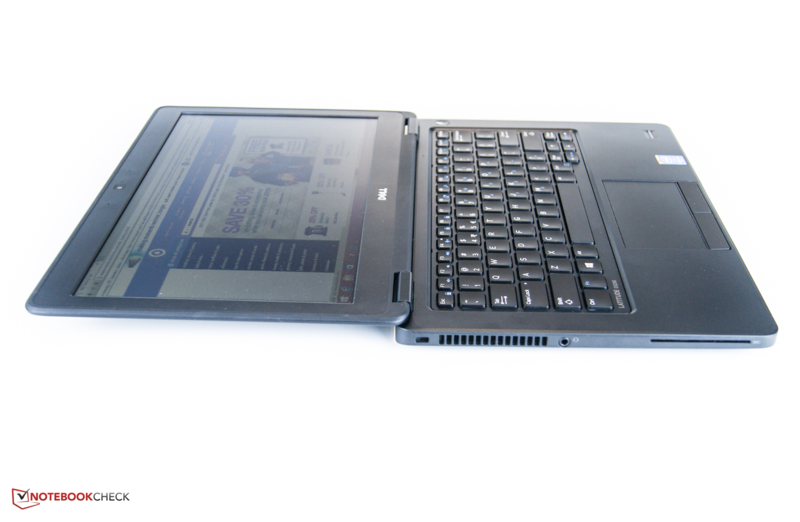 An exception is the important Work category where Lenovo's ThinkPad X240 is on par. 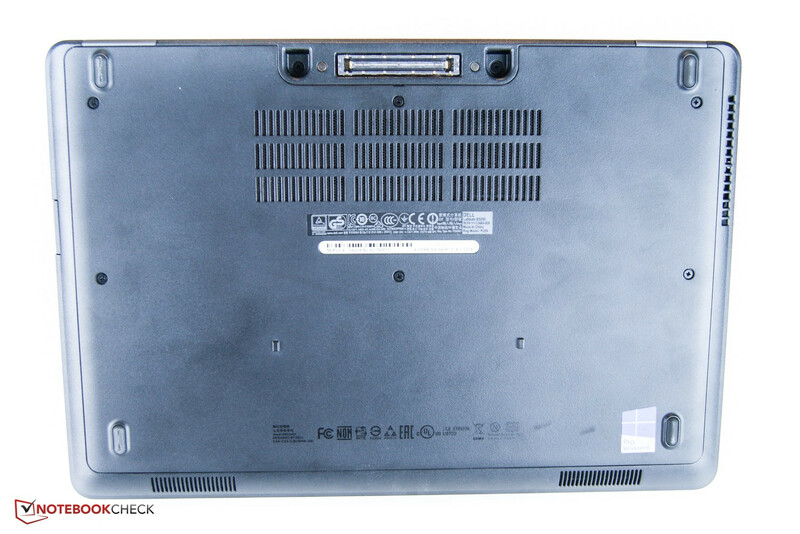 PCMark 7 hints at an actual hardware advantage of Lenovo's laptop. The 800-Euro (~$946) more expensive ThinkPad achieves a 14% higher score here. 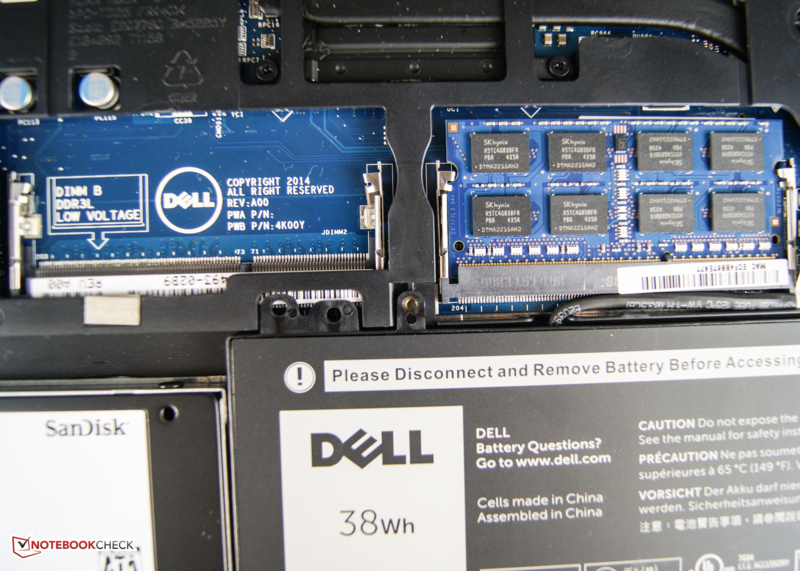 A swift SSD storage is installed instead of a slow-spinning magnetic drive. This could even be the motto for the selected configuration. 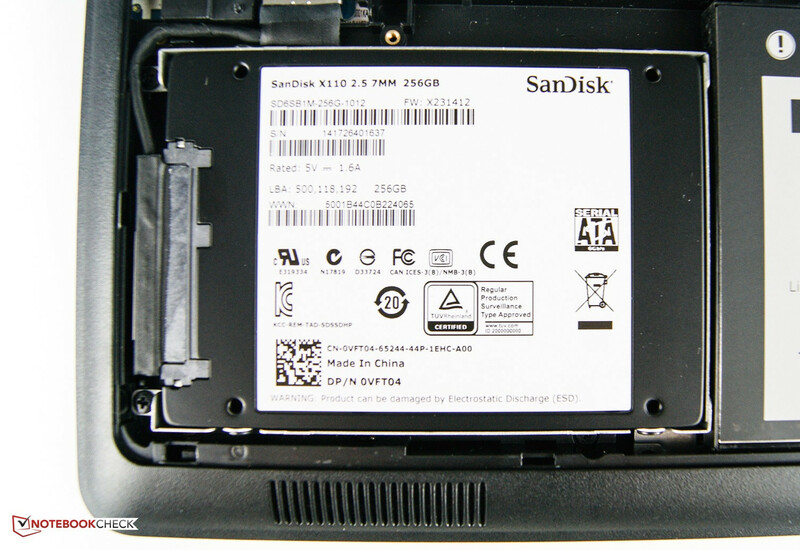 Only the pricey Lenovo ThinkPad X240 also relies on this hard drive type. 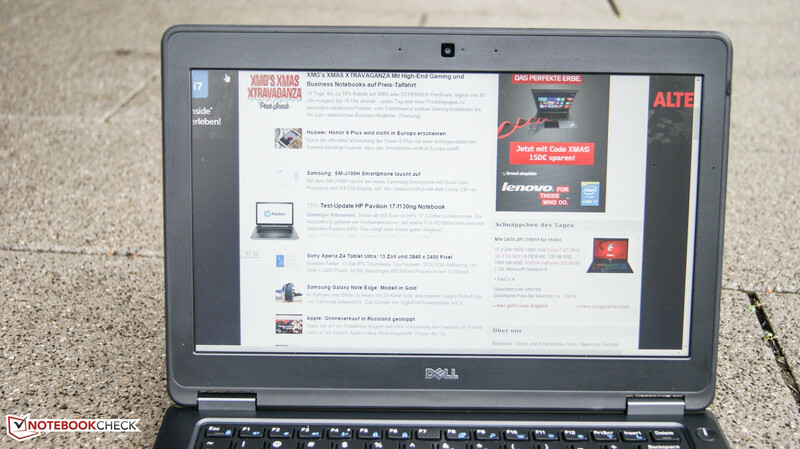 Although Dell's laptop achieves decent rates, Lenovo's laptop reaps in slightly better scores. The Latitude lags behind except for in the sequential read rates. Nevertheless, it outshines the other comparison devices. A less expensive 500 GB HDD can be selected instead of the SSD option. 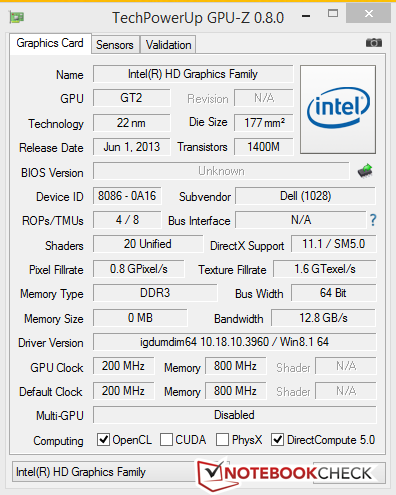 Intel's HD Graphics 4400 processor graphics card is found in the 12.5-inch review sample. The graphics unit supports important standards, such as DirectX 11.1 and OpenCL 1.2. 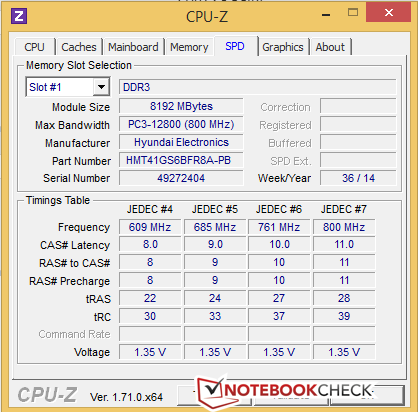 It operates with a core clock of up to 1100 MHz and a memory clock of 800 MHz. A look at the competition shows that all, except for HP's EliteBook 725 G2, are based on an identical graphics card. The difference is found in the installed CPU. It is stronger in Lenovo's device and a bit weaker in Asus' laptop. 3DMark 11 should decide this battle of graphics cards. Our review sample triumphs with 930 points and outperforms its rivals with the same graphics solution by 10%. HP takes the first place with its AMD Radeon R6, which surpasses Dell's Latitude E5250 by 11%. 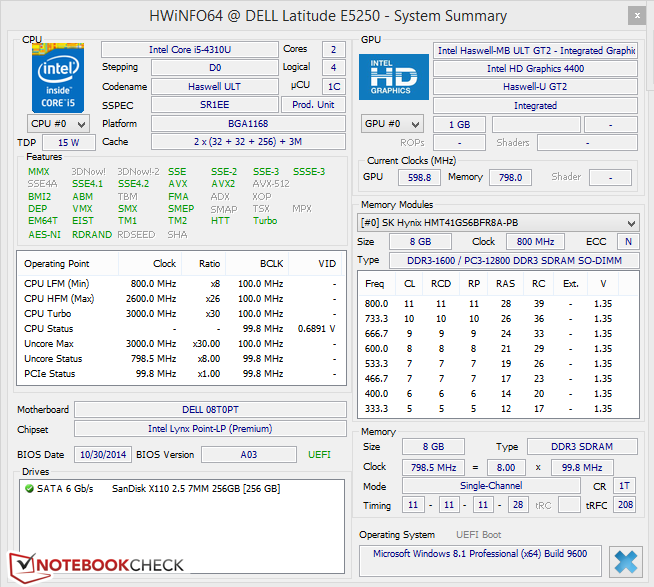 The Intel HD Graphics 4400 in Dell's Latitude achieved 11937 points in 3DMark 11 on battery power. That means that performance losses will not occur during mobile use. More details about the installed graphics card and benchmark scores can be found in our FAQ section. Gaming issues are not important for routine business use, but we will take a brief look at this topic anyway. The integrated graphics card at most allows playing older games or even some newer ones using minimum quality settings. For example, it is possible to play Anno 2070 from 2011 or Tomb Raider from 2013. Although we set all settings to a minimum, it was just enough for playing BioShock Infinite smoothly. Even HP's EliteBook 725 G2, which was stronger in 3DMark 11, does not show smoother frame rates than Dell's Latitude and scores considerably worse in total. The fan's characteristic in idle operation is mostly passive. Rarely did we hear the quietly spinning fan. The noise development also stayed within acceptable limits during load. The only conspicuous thing we noticed in our review sample was that the fans occasionally rattled. In terms of maximum noise, Lenovo's ThinkPad X240 is considerably louder with 41.6 dB(A). Asus' Advanced presents itself as a quiet comparison laptop with a maximum rate of 33 dB(A). The analysis of the surface temperature on HP's laptop is mostly decent. It is, however, a bit disconcerting that a hot spot of 39.1 °C is reached in the lower area in idle mode. It heats up to 43 °C during load. This maximum temperature development is favorably located on the underside of Dell's device and not in the user's work area. Lenovo's ThinkPad is an alarming sample with up to 50.1 °C. 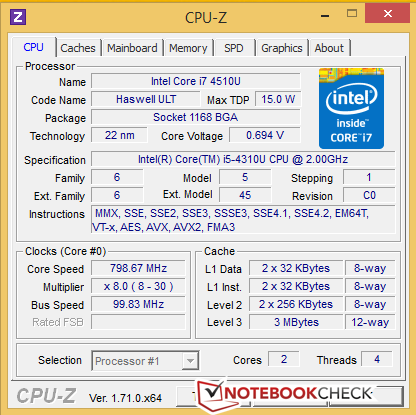 The power supply of our business laptop does not get dangerously warm with 34.1 °C in idle and 42.1 °C during load. 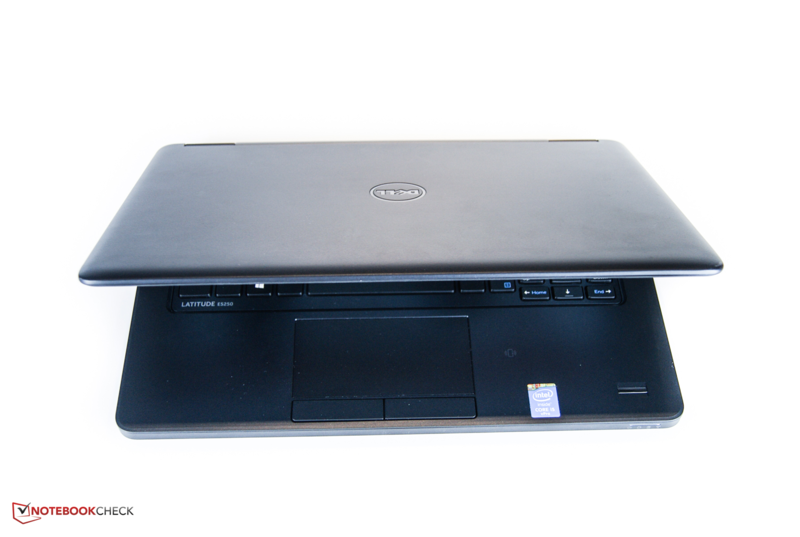 We push Dell's Latitude to its limits in a stress test scenario. 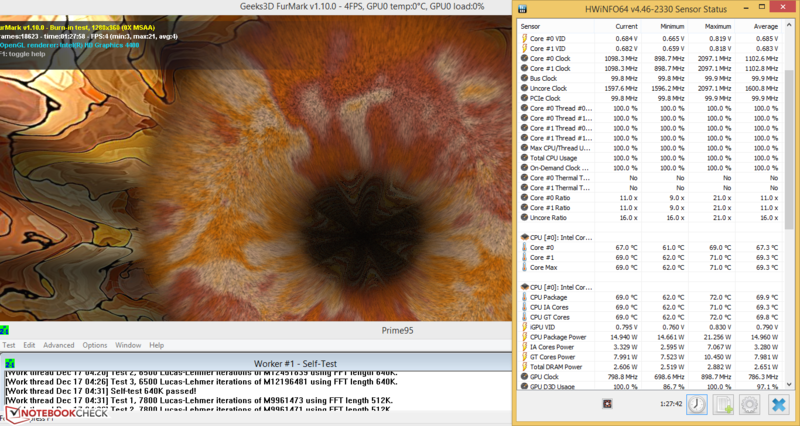 The inner temperatures are recorded after one hour of FurMark and Prime95. The CPU's clock rate dropped to approximately 1.0 GHz right at the beginning of the test, which is below its base clock of 2 GHz. 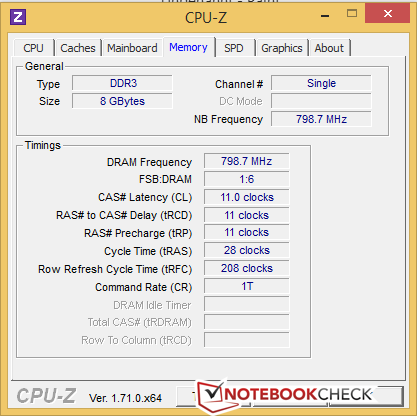 Its average clock speed was 1.1 GHz after one hour of testing. The CPU's temperature only temporarily climbed over 70 °C and was just below that on average. We reran 3DMark 11 after the stress test and hoped for the same scores as after a cold start. This is also the case here: 928 points point to an uncompromising workflow. The installed speakers provide a pleasing volume that even allows making Skype conferences in louder environments. However, they are only conditionally suitable for background music. The sound spectrum is mainly focused on many mids and a bit of treble. There is absolutely no bass. Overall, music pieces sound muffled. Nevertheless, it is more than enough for system sounds or an occasional YouTube video. Users who like to listen to music when working should connect headphones or external devices. The 65-watt power supply is never completely exhausted. It requires an average of just 29 watts even during load. A rate of 45 watts was only temporarily reached when the stress test programs Prime95 and Furmark were initiated. Thus, the power consumption is lower than that of the rivals. It does not look much different in idle mode. Our review sample is not particularly guzzling with 3.6 - 7.7 watts. 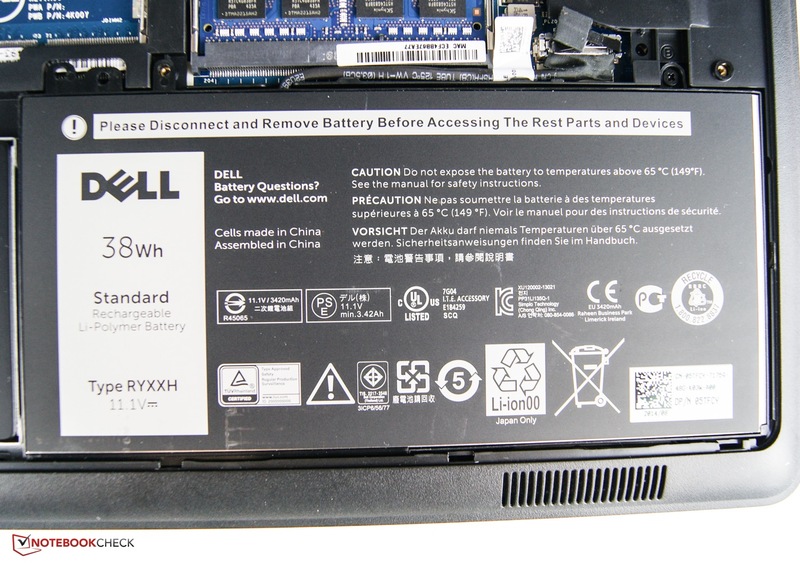 All contenders consume only 0.1 watts in standby, which is half of what Dell's laptop requires. 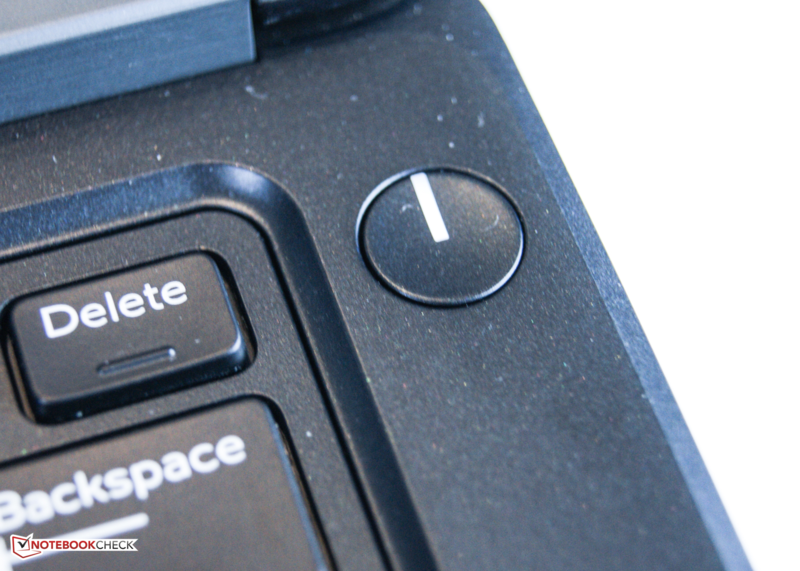 There are three battery options available in the Latitude E5250 lineup. In our case, Dell's laptop sports a 3-cell, 38 Wh battery. However, we could read out a slightly higher capacity of approximately 40 Wh. A 4-cell, 51 Wh battery is offered as an alternative. 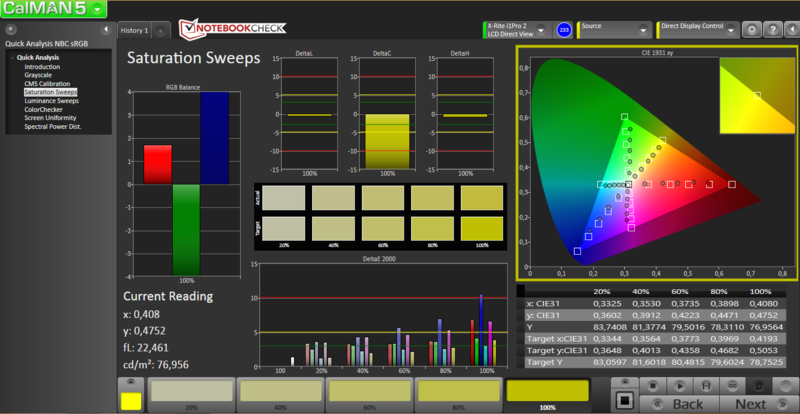 We use the Battery Eater tool for determining the maximum possible battery runtime. The screen's brightness is set to minimum, all communication modules are disabled, and Windows energy-saving profile is enabled for this. The Reader's test, which simulates reading texts, recorded a runtime of 10 hours and 46 minutes. We browse via Wi-Fi for testing a real-world scenario. The brightness was set to roughly 160 cd/m² and all communication modules were enabled. Dell's laptop shut down after 5 hours and 31 minutes. Lenovo's device lasts 2.5 hours longer and can almost manage a whole workday without its power supply. Our review sample achieved a runtime of almost 2 hours when we set the brightness to maximum and ran Battery Eater's Classic test. 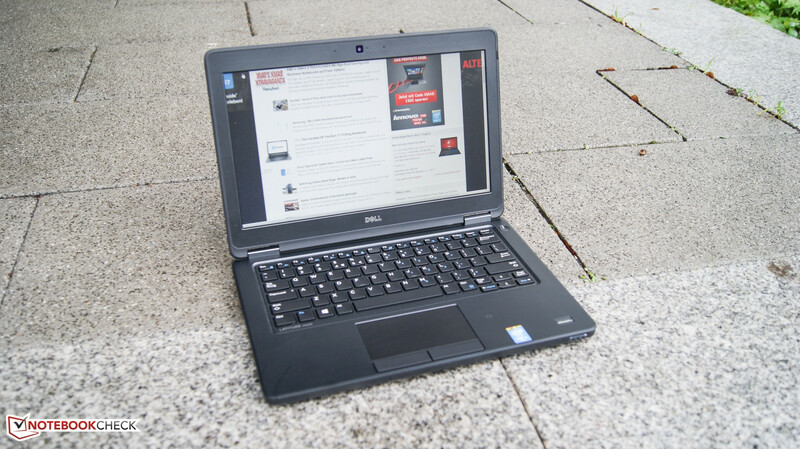 Dell's Latitude is generally within a good range. Potential buyers should consider opting for the 51 Wh model to turn the Latitude into a real office machine. Dell does not yet state a price in the configuration process but only describes it in the spec sheet. Though Dell's Latitude E5250 is 1.5-inches smaller than its 14-inch sister, it is nevertheless a well-conceived business laptop. The casing not only compels with its elegant yet basic looks but also with its impeccable build. Unfortunately, the display does not feature a high-quality magnesium back despite the steep price of 1050 Euros (~$1242). Also, the maintenance cover should be reworked. The user will quickly fear that the small clips will break when removing it. We especially liked the input devices. They are not only suitable for mobile use but can completely replace external devices. The pressure point and typing feel are also decent. Dell capitalizes security. The device features NFC and a mechanical SmartCard reader, and many software options are available directly in the order process - though not for free. The biggest shortcoming of the E5250 is its screen. A TN screen with low brightness spoils the otherwise good laptop. Outdoor use is difficult despite the matte screen. A Full HD IPS screen is only available for a surcharge. 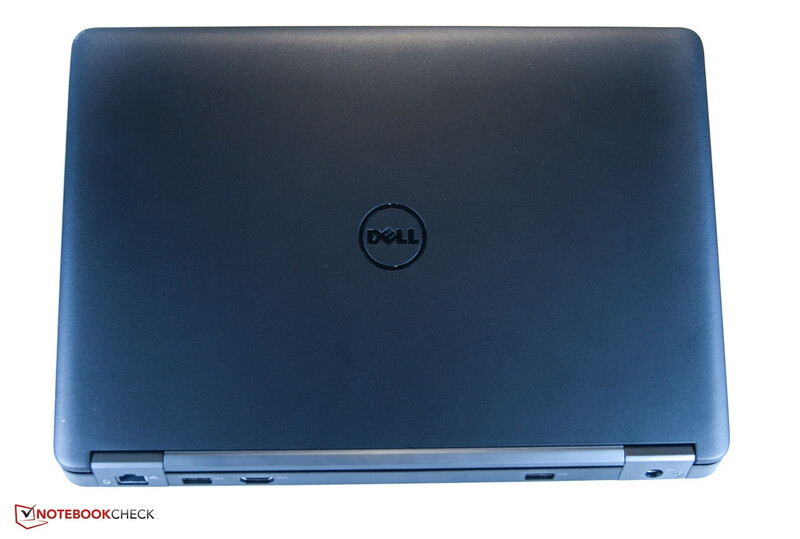 Dell's Latitude can score again in system performance. Owing to the swift SSD and enough computing power, the sample is always prepared for every task. Even the emissions are largely good. The noise development during load remains pleasant and the device can be used without external power for quite some time for managing everyday work. However, it will not last a whole workday in view of our Wi-Fi test. 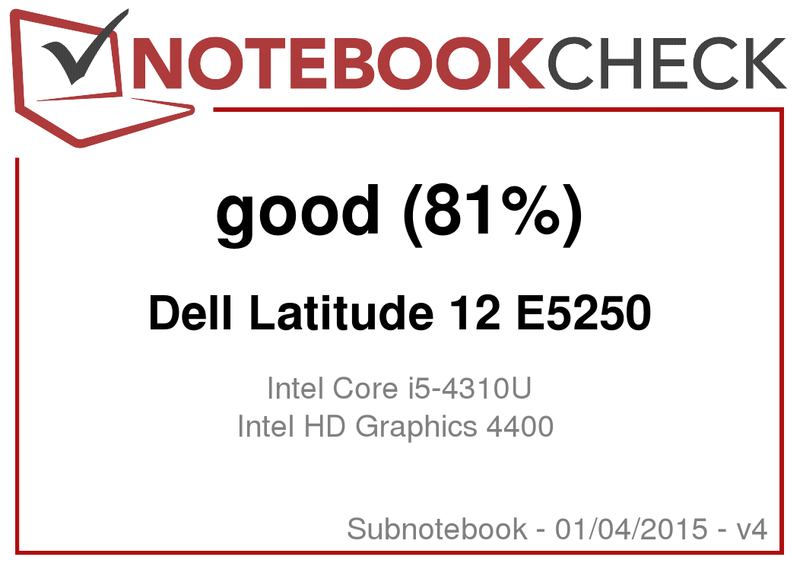 All in all, Dell's Latitude E5250 scores very well. Many options that would turn the device into a business machine are only available for a surcharge, though. Buyers with the necessary wherewithal can configure a great 12.5-inch laptop. Anyone with a clear price limit should take a look at the competition. ...with another battery offered in the configuration process. The buyer has to dig deep into their pocket for the docking station. ...but, unfortunately, not without a surcharge. The ingenious interface strategy and decent system performance. A brighter screen available without a surcharge. 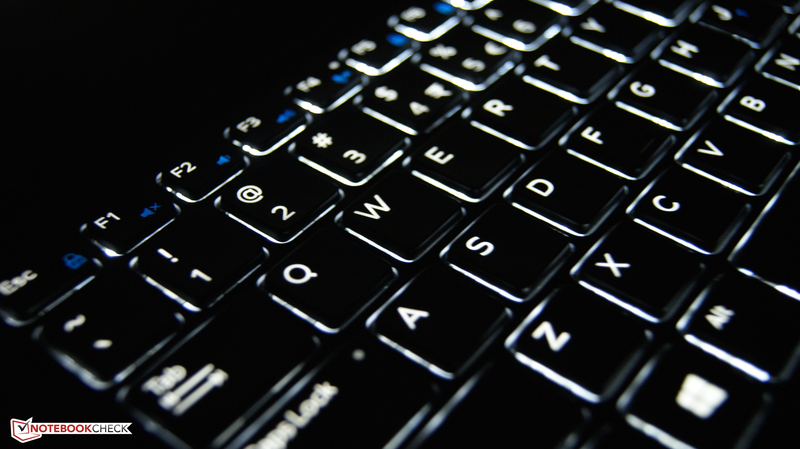 The well-conceived input devices in the small 12.5-inch device. Time-consuming office tasks are not even a problem on-the-move. If the buyer finds Dell's Latitude too pricey and can waive some performance components, they should look at Asus' ASUSPRO Advanced BU201LA. Lenovo's ThinkPad X240 is inviting when the price is an irrelevant factor. HP's laptop is even cheaper than Asus' device: HP's EliteBook 725 G2 is exclusively furnished with an AMD APU and GPU.